Shooting Review – Ruger Mark IV 22/45 Lite Pistol | Eagle Gun Range Inc. Improvement and upgrades are a good pattern to follow for pistol model progression. The Ruger Mark IV 22/45 Lite is a nice improvement and has excellent upgrades over the previous model. This small, light, attractive pistol is an excellent platform for a suppressor and makes for a fantastic plinker. Why Consider the Mark IV 22/45 Lite? 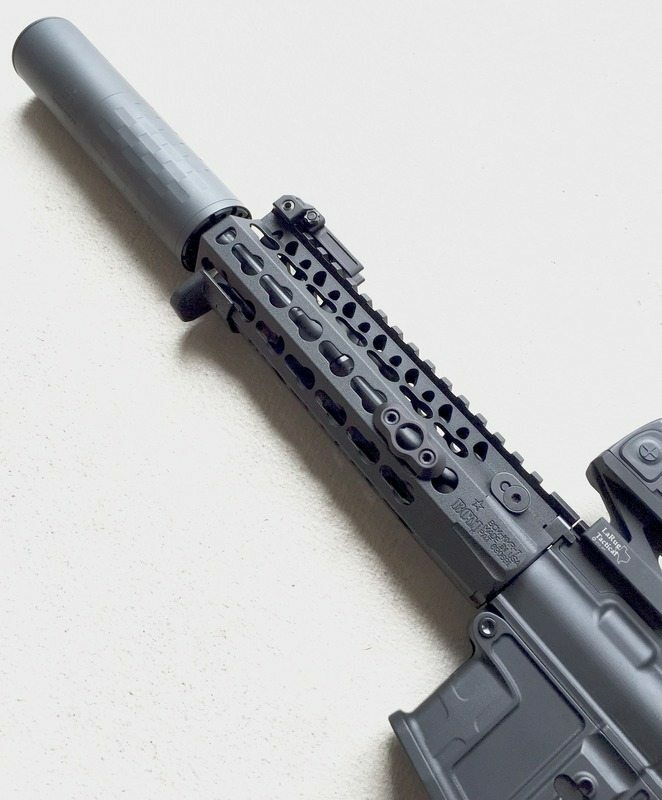 Its light weight and short, threaded barrel make it an excellent suppressor gun. So, the 22/45 Lite is an excellent range shooter or recreational pack gun. Keep in mind, though that while it is built to be accurate, it is not a serious, precision target pistol. Among 22 pistols, the Ruger Mark IV 22/45 Lite has about the easiest takedown of any gun. It takes about 2 seconds to completely fieldstrip: press one button on the back of the pistol and the slide comes off the frame and you can pull out the bolt for easy cleaning. Done! The Ruger Mark IV comes in two finishes: black or bronze. The slide (not really a slide, per se) detailing differs between them, with the black model having straight-drilled cutouts and the bronze model having contoured cutouts. As with most .22 pistols, shooting the Mark IV 22/45 Lite is fun. Very fun. It’s actually a bit more fun than most with this one, though, because it weighs so little. 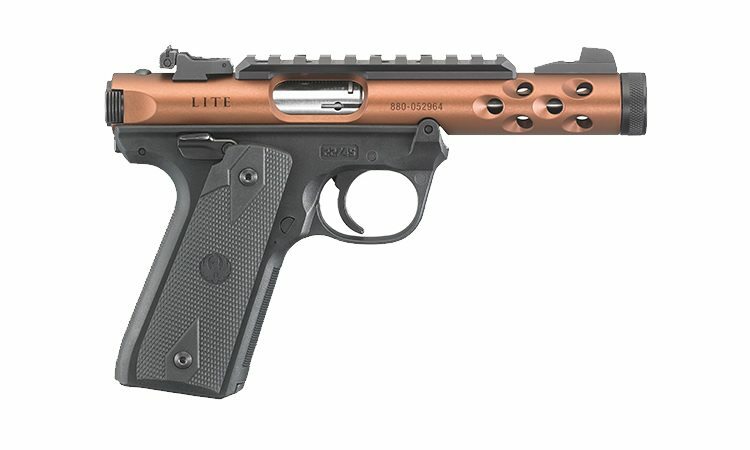 “Lite” is right, this is a pistol you could shoot all day and not get tired. The grip is quite nice, with checkered texture on the front and back of the polymer grip and grippy 1911-style rubberized panels on the sides. Very easy and comfy to hold onto. Though it comes with a picatinny rail, I used the iron sights for my shooting. I found it to be a comfortable and accurate shooter, with one caveat: the lack of heft made it a bit harder to be extremely precise. I could see the slight wobble in my sight picture and anything but a perfect trigger press could cause the point of impact to vary slightly for me. All of this is my fault, of course, but a heavy gun (like the S&W 22 Victory, for instance) would mitigate these issues slightly. This is a bit nitpicky, I admit. The action is manipulated by pull-tab “ears” on the back of the slide. They’re easy to grasp and very grippy. You should be careful to slingshot it, though, as if you ride it forward (it’s a short trip) it will pinch the heck outta your fingers. Got me a couple of times. The trigger breaks at around 5 pounds and is not at all bad (much better than the Mark III, I’m told). Volquartsen makes a replacement trigger and sear that will bring the break down to about 3 pounds. The front sight is fixed and the rear sight can be adjusted for windage and elevation. I found the front sight to be rather wide and it takes up almost the entire rear-sight notch in the sight picture. I think I’d prefer a thin blade for a plinker like this. The controls all seem to be in good positions for my medium-sized hands. The Mark IV 22/45 Lite comes with a thumb “safety” on both sides of the frame. Apparently this can be modified to be left-side only. I wish it could be modified to have no “safety” lever at all. I like how the magazine drops free (an upgrade from the Mark III) and seats flush to the grip. The one-button takedown is a very nice feature and a great improvement over previous models. Finally, I think the eye-candy factor is pretty high, without being too gaudy. It’s a handsome gun. The Ruger Mark IV 22/45 Lite is very light and easy to shoot, manipulate, and to do so for extended periods. The rubberized grip panels make holding it very comfortable and sure. The trigger is pretty good and some folks will appreciate the ambi “safety” levers. The one-button takedown is glorious and the gun just looks nice. The only nits I can pick here are the chunky front sight and the presence of “safety” levers. Beyond those, there’s not really anything terribly wrong with this gun. It’s easy on the grip and easy to manipulate the controls. It’s an easy, fun shooter. I had no malfunctions or other complaints while shooting it, save the nitpicky front-sight issue. The Mark IV is plenty accurate, but as a light pistol it won’t be as easy to get precision hits as would if it were 10 ounces heavier. There are a few aftermarket components available that some might enjoy, like fiber optic front sights and different trigger, but there’s not a lot you’ll want to modify here. The Ruger Mark IV 22/45 Lite is an attractive, light, easy to take down and clean, fun-to-shoot pistol with a decent price. If you’re a plinker, I’d recommend it highly to you; especially if you favor suppressed pistols. If you’re not a plinker, try the Mark IV 22/45 and see how you feel about that afterward. 22-caliber suppressors are not very expensive. Almost makes you want to get this pistol just to take advantage of that fact, right? Great pistol! Shot it at the range tonight! Can’t wait to own it!